The Syrian President Bashar al-Assad said that holding elections of local councils on time proves the strength of the Syrian people and the state. 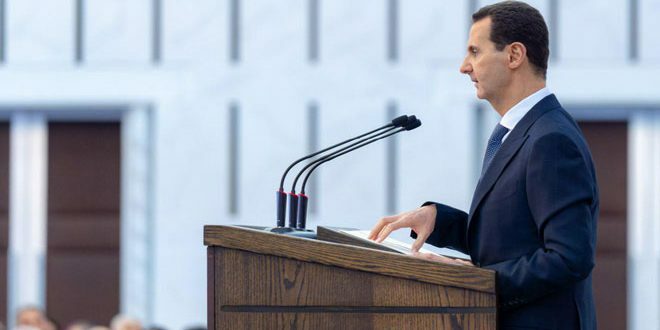 President al-Assad, in a speech during his meeting with heads of local councils from all provinces on Monday added that the elections proves the failure of enemies’ bet to turn the Syrian state into a failed state unable to perform its tasks. “The absence of belonging to the homeland is the fuel which is used by the foreign parties to target our homeland,” President al-Assad said, adding that the Syrian state works on the return of all the displaced due to terrorism because their return is the only way to end their suffering. The Russian interest in the transition of Turkey from the bank of the war on Syria to the bank of the political settlement was not mere a wish but it is an outcome of the certainty of the impasse drawn by Russia against Turkey’s bets on its role in the war, the high cost of the bill of these bets, the equation of running the relationship with Turkey which is based on attracting, and raising the ceiling of challenge in exchange for opening the way for containment. The battle of Aleppo which took place two years ago was the turning point, where Turkey started a curved path of interaction with the Russian plan, towards the decisive decision of Turkey concerning Idlib and the positioning under the ceiling of the Russian vision. The completion of Astana path which its title was a Russian-Iranian pressing military siege on one hand and an attracting political and economic siege on the other hand is culminated today after two years of making efforts regarding the Turkish path. Astana’s title turns into a formula of political efforts of the path which failed in Geneva. Turkey plays a similar role to that of Iran played with the support of Russia in attracting Turkey; it supports Russia in attracting Europe represented by the French and the German forces to Istanbul path, where the issues of the return of refugees, reconstruction, and the political process will be discussed. A long time ago, Russia was interested in dismantling the front which Washington made for the war on Syria. The pivotal role of Turkey in this war was the reason of the focus on it as a result of the Russian understanding of the political geography which surrounds Turkey and in which Russia and Iran are important factors in economy and security. Russia was interested in attracting France and Germany with the force of economy and security from the gate of immigrants and reconstruction. It depends on Turkey the involved partner in the two titles, benefiting from the accumulative European experience with the American behavior in managing the issues of the region without making any consideration to the European interests. Europe has two blatant examples one in dealing with the Palestinian cause in a way that threatens of blowing up the region and expelling millions of displaced to Europe, and the other is in dealing with the Iranian nuclear file in a way that threatens of Iran’s escalation against Europe at the first place, Therefore, Russia can make use of the European differentiation and employing it, where Europe in return can influence it and try to change the American positioning which lost its bets on Syria, while it is not able to change the fate of the Palestinian and nuclear titles before Washington changes its bets. The French-German participation in Istanbul Summit on Syria, alienates Turkey from the position of avoiding paying the bills of being involved in the war to the position of gaining more gains through playing a pivotal role in the political process and in two important issues: the return of the refugees and the reconstruction from the gate of the European role which Moscow seeks to attract to end the war on Syria, along with a similar path to Astana which Turkey needed two years to take its decision since Idlib agreement. This means that there will not be high ceilings for Istanbul Conference, rather a path that completes Astana path with the same clarity and stability. At the moment of American recognition of the inability to change the situation in Syria, and the need to search for alternative in politics the US National Security Adviser John Bolton went to Moscow to discuss that. He may receive an invitation to participate as an observer in Istanbul path as was the case with Astana. Moscow is making its strategy step by step.